Back Again, eh? I suspect you be wanting the usual. While Valence has claimed to be the first to offer large-format, lithium iron phosphate (LiFePO4) cells, a chemistry developed and supplied by Phostech, other companies now will offer the large-format technology. 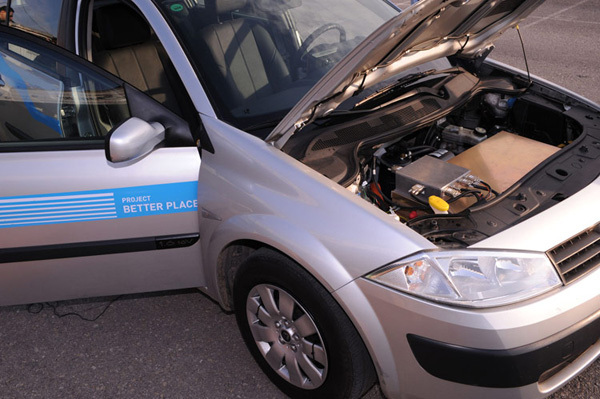 An earlier version of the new LTC battery went into the first, prototype electric sedan for Project Better Place. Lithium Technology Corporation (LTC) has introduced a new line of high energy density lithium iron phosphate (LiFePO4) cells, the largest cells of their kind in the world. The large-format technology allows for the development of safer battery systems with a significantly lower number of cells. The weight of the battery is decreased while performance and safety monitoring capabilities are increased, according to LTC. The battery management system (BMS) precisely monitors fewer cells, keeping them in balance for best performance and preventing damage to the battery due to over voltage, under voltage, over temperature and short circuit. The new high-energy line offers cells ranging from 8 Ah to 40 Ah, with nominal voltage of 3.2V. (Note: The 40 Ah high-energy cell is 232mm in height and 60mm in diameter.) The specific energy is about 90 Wh/kg, and the volumetric density is approximately 220 Wh/L, according to Dr. Klaus Brandt, LTC’s CEO. Internal resistance will be in the range of 3-4 milliOhms. LTC built a 7 kWh conversion pack and converted a Prius to a PHEV to demonstrate its capabilities. 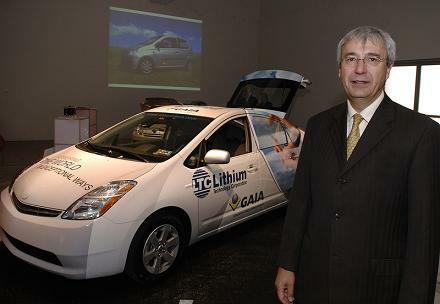 Dr. Klaus Brandt, chief executive officer of Lithium Technology Corporation, has his eye on military and commercial markets for high-energy, lithium ion cells. In addition to Project Better Place in Israel, LTC is in discussions with, what GCC coyly describes as “a commercial electric vehicle manufacturer in the UK” and which probably is Smith Electric. LTC began to offer these cells, ranging from 6 Ah to 35 Ah, to developers of HEV (hybrid) and PHEV (plug-in hybrid) vehicles. Dr. Andrew Frank, Professor Emeritus, Mechanical and Aeronautical Engineering at the University of California, Davis, and who is widely credited with introducing the current conceptualization of plug-in hybrids, uses and endorses the new high-power line that LTC introduced last year. LTC cells use LiFePO4 licensed technology, developed by Prof. John Goodenough with the University of Texas and supplied by Phostech, in which German chemical major Süd-Chemie has a majority holding. LTC has been working closely with Süd-Chemie and Phostech, the patent owners of the iron-phosphate technology, to further improve electrode materials. ["To deliver a higher-energy battery, LTC worked on thickening the cathode material." They] had been working with T/J Technologies on advanced electrode materials. However, in January 2006, T/J technologies became a wholly owned subsidiary of A123 Systems, Inc., [a major competitor]. At that point, according to Amir Elbaz, CFO & EVP for LTC, Süd-Chemie approached and proposed working together. Süd-Chemie had taken an interest in Phostech in 2005 and then acquired the majority holding. LTC hopes, in collaboration with Phostech, to improve the energy density to above 100 Wh/kg. But the company positions the iron phosphate chemistry, even with its lower voltage, as being the most appropriate for consumer applications due to its inherent safety and resistance to abuse. 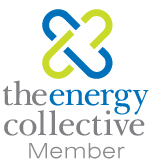 This entry was written by jcwinnie, posted on 2008-2-23 at 2:08 pm, filed under chemistry, development, transportation, world and tagged chemistry, electric drive, power electronics, traction battery. Bookmark the permalink. Follow any comments here with the RSS feed for this post. At some point you no longer can call it a drought, because it’s about a climate shift to a drier climate. No one says the Sahara is in drought. Hard Carbon Chemistry on the Ener1 Horizon? Writing for EETimes, Amir Ben-Artzi informs that Project Better Place has named three more partners for its planned project of an electric recharge grid network infrastructure for electric vehicles. Amir Ben-Artzi also reports that “Tower Semiconductor (Migdal Hemek, Israel) is set to participate in Project Better Place. Tower is expected to develop the controlling processor, which will include non-volatile memory. The component regulates the transfer of power from the batteries to the wheels and between the motors and sensors in the car, among other functions. Another potential customer for Tower’s automotive component could be the joint car project by Israel Corp. and Chinese automaker Chery. Israel Corp. will take a 45 percent stake in the venture, worth about $225 million, with Chery presumably taking the other 55 percent. Li-Ion technology, which is better suited than NiMH to meet USABC’s PHEV battery design goals of high power and energy density, is following multiple paths of development. Lithium Iron Phosphate is one battery chemistry that the ITS analysis favors. Another that they seem to favor greatly is the manganese titanium LiMnTi formula. A recent report from the Institute of Transportation Studies at UC Davis indicated that the development of plug-in hybrids “will depend on consumers’ driving and recharging behaviors, as well as their valuation of different PHEV designs and capabilities.” Green Car Congress relayed some key conclusions to the report. In turn, producer and consumer behavior alike can be shaped by government regulation, e.g., California’s ZEV mandate. Thus, while the USABC (and others) provides a useful benchmark for the future of PHEV battery technology, there may be a role for less ambitious PHEV designs, such as blended PHEV conversions, as well as Toyota’s demonstration of a PHEV Prius using NiMH. The ITS analysis warned that there are trade-offs. It assessed battery development according to five main attributes: power, energy, longevity, safety and cost. 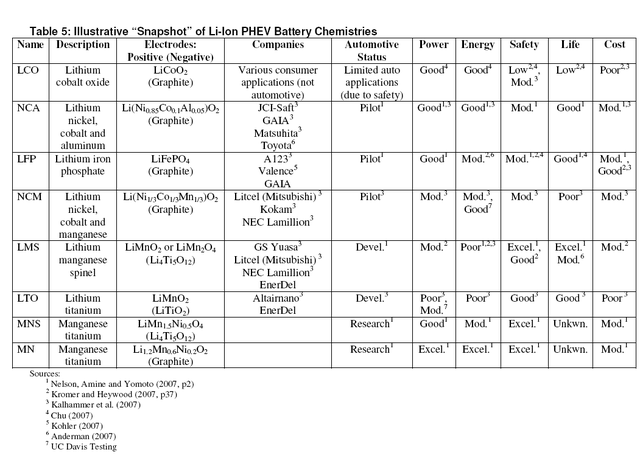 No battery currently meets all of the USABC’s PHEV goals for these attributes. Attempts to simultaneously optimize power, energy, longevity, and safety will increase battery cost. This site contains copyrighted material the use of which has not always been specifically authorized by the copyright owner. Such material is made available in an effort to advance understanding of issues of environmental and humanitarian significance. We believe this constitutes a 'fair use' of any such copyrighted material as provided for in section 107 of the US Copyright Law. In accordance with Title 17 U.S.C. Section 107, the material on this site is distributed without profit to those who have expressed a prior interest in receiving the included information for research and educational purposes. This site is protected with Urban Giraffe's plugin 'HTML Purified' and Edward Z. Yang's . 6372 items have been purified.